We have been working very hard on Arts at Appledore School in the last couple of years. We were awarded a Gold Artsmark by Arts Council England and are well on the way to becoming a specialist school for the arts. We have made (summer 2017) our own community arts space and resource at the heart of our school:The Harbour Studio. We have built an open, engaging Arts space that provides our community with connections, lifelong creative memories and skills. The children at Appledore School helped to plan and design the space and have ownership and weekly access to this purposely planned space. 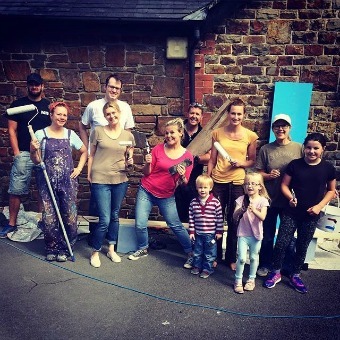 In the 'The Harbour Studio' we support other schools and community groups and run creative messy play sessions for under threes, professional development for staff in our school and neighbouring schools, making sessions for parents and families, theraputic arts sessions and intergenerational projects.